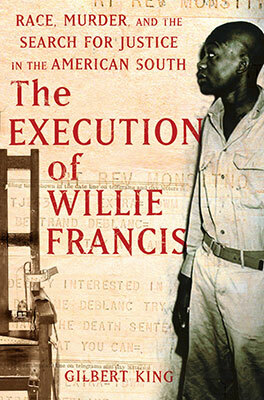 On May 9, 1947, Willie Francis was executed in the same electric chair that he had walked away from a year and a week earlier, when a drunken prison guard and trustee bungled the wiring. Willie’s story had made front-page headlines around the country as the United States Supreme Court grappled with questions about what the State of Louisiana was permitted to do with regard to double jeopardy and cruel and unusual punishments. One of the things that drew me to this story as I was working on my book, The Execution of Willie Francis, was the shroud of secrecy that surrounded the Willie Francis case. Willie was accused and convicted of killing 53-year-old Andrew Thomas, a Cajun pharmacist who was something of a mystery to the people in the small town of St. Martinville, Louisiana. Thomas’ brother Claude was the town’s chief of police, and Willie was convicted by twelve Cajun jurors and sentenced to death by a Cajun judge. His court-appointed attorneys neither called nor cross examined any witnesses, and did not even make a case in defense of their 16-year-old client. The prosecution based its entire case on a confession obtained while Willie was in police custody without the aid of a lawyer. In this confession, Willie wrote, “it was a secret about me and him,” which was never explained. It was obvious to me that there was more to Willie’s story than the version presented in trial and to the public. 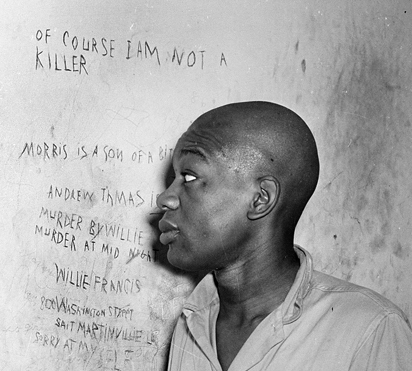 In my research, I came across a photograph taken on the evening Willie had survived his own execution. He’d been brought back to his cell, and the sheriff allowed reporters and a photographer to visit with Willie, where he told them that death tasted “like peanut butter” and looked a lot “like shines in a rooster’s tail.” The photographer asked for a few pictures, and Willie, holding his dog-eared Bible, stood in front of a dull pink wall. The flash fired. This picture was never used by any of the newspapers. 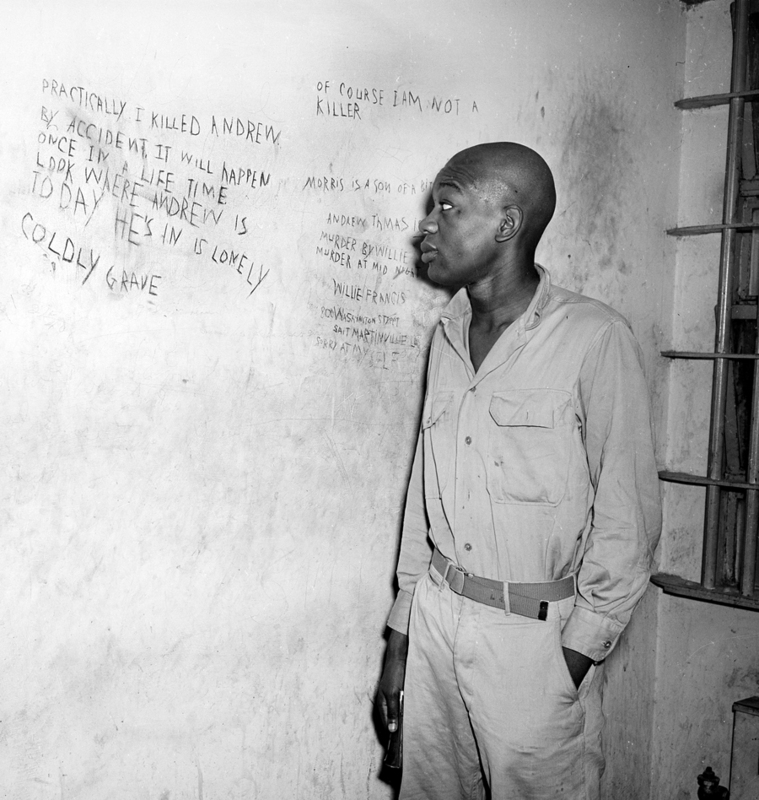 There was a lot of glare on the wall, and the photographer had gotten a much better one of Willie smiling — the picture that ended up on the front page of many newspapers the next day. But there was some writing on the wall image that was barely legible. I scanned it onto my computer and ran it through Photoshop, adding contrast and burning and dodging until the words could be read. The handwriting matched Willie’s. Detail of the enhanced photograph. Click for the full image. Only two people know the truth about that fateful confrontation at the house of the Cajun bachelor and the black teenager who once worked for him. Both are dead, and the official story does not ring true. Willie Francis never denied killing Andrew Thomas. But he disputed the prosecution’s accusation that he was trying to rob the pharmacist. “I wasn’t after money,” Willie insisted to a reporter before he went to the chair a second time. Yet he would never elaborate, and took whatever “secret” there was between him and Thomas to his grave.